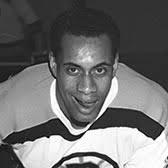 WHAT: Join the Harvard Club for this special documentary event about Willie O'Ree, the first black hockey player in the NHL. “Willie” will make its World Premiere as part of the Hot Docs Canadian International Documentary Festival on Monday, April 29 at the Ted Rogers Theatre on Bloor Street on Toronto, Ontario. See the NHL media release here The film begins at 6:30 and runs for 89 mins. It will be followed by a 45-minute Q&A with Willie, Director Laurence Mathieu-Leger, Producer Bryant McBride and a special guest from the film, and will be moderated by former NHL player and current NBC hockey contributor, Anson Carter. Bryant McBride, the film’s Producer, received his MPA from the Kennedy School in 1990. Bryant went on to become the NHL’s first black vice-president and founded the league’s diversity program. He located Willie O’Ree and brought him back into the NHL as its diversity ambassador more than two decades ago. Harvard Club of Toronto member Stephanie Geosits (MPP 1998) worked with Bryant and the NHL its diversity programs, including Willie’s efforts, and improving opportunities in hockey for minority youth. She worked for Bryant at the NHL after graduating and is part of Team “Willie." Find out more about the film and the event on the Hot Docs website or watch the trailer. We have a limited number of tickets for Harvard Club of Toronto members for April 29. You can also catch this wonderful film on Tuesday, April 30 or Friday, May 3. Buy tickets to these screenings through Hot Docs.